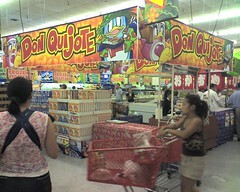 Don Quijote is a quirky Japanese department store chain that’s bringing its distinctly colorful, sometimes chaotic shopping experience to Hawaii. 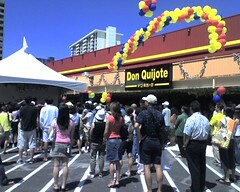 Don Quijote is a quirky Japanese department store chain that’s bringing its distinctly colorful, sometimes chaotic shopping experience to Hawaii. Its flagship store, the first in the U.S., held its grand opening at the former Daiei location on Kaheka Street near Ala Moana today. 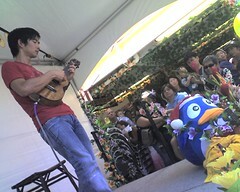 The carnival atmosphere outside (courtesy lion dancers, live music by Jake Shimabukuro, and wandering balloon artists) was echoed throught the aisles within, the place packed floor to ceiling with just about anything you could imagine, and with psychedelic signs and banners (and the store’s blue penguin mascot Donpen) dominating the view in every direction. Visiting Donki stores in Japan is apparently even more disorienting, with purposefully cluttered aisles, noisy displays, and products scattered randomly to make shopping more of a treasure hunt. But the whimsical outlook has served it well, the chain growing to over 100 stores with over $2 billion in gross sales last year. And judging by the crowds, long checkout lines and overflowing shopping carts, Donki will probably do quite well in Hawaii. Daiei will surely be missed, having served Honolulu well since the ’70s. 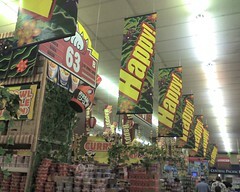 I remember its first store at Pearlridge, and its expansion in the ’80s through the acquisition of Holiday Mart locations. But Donki seems a worthy successor to its place as the destination for Japanese knick knacks. I’m not sure how long it’ll take before people stop calling the place Daiei, though… since some people still call it Holiday Mart. See all my cameraphone pictures here.